Refresh Your Kitchen and Ceilings With Our Professional Cleaning Services! After our overnight restaurant kitchen ceiling cleaning, any kitchen will have a brighter, more professional appearance. Our commercial kitchen equipment cleaning is done after hours, and twenty-four hour restaurants are also easily cleaned during slow hours. 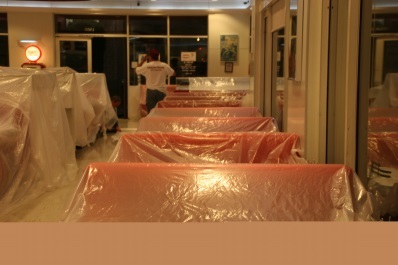 To achieve this fresh look, Ceiling Ease arrives as the restaurant staff is leaving the kitchen for the night. Restaurant staff does not need to stay unless their company requires it. However, a three foot clearance is needed from tops of racks to properly clean so restaurant staff must have already removed all food, breakable items, and paper notices from the walls. Our commercial kitchen equipment cleaning crew will then bring in their equipment and supplies and begin the cleaning process by moving the restaurant equipment on wheels into a separate area. Crew members will then spread vinyl tarps over stationary racks, ovens, and other items to prevent them from getting wet. The “dirt” on kitchen ceilings is a mixture of grease, oil, dried water, salt, spices, flour, and many other chemicals. 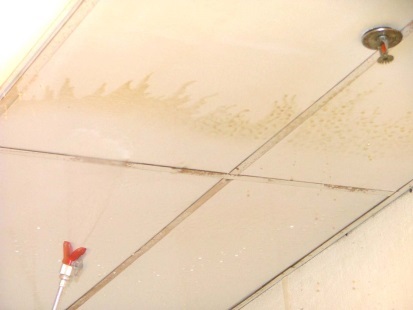 To remove this residue, a chemical degreaser is applied evenly across the ceiling. Any especially dark spots may be sprayed twice. After the chemical has loosened the residue, crew members begin power washing the ceiling. Again, any extra dark spots may need a reapplication of chemical and a second power washing. After the power washing, Ceiling Ease crew members will utilize long handled mops to dry the ceiling. To remove the excess water and prevent drip marks, the wiping of the tiles and t-bar requires even strokes and frequent changing of the mop pads. Typically, that ugly tan tint on tiles shows at least a 70% improvement in appearance after this cleaning process. In addition to the drying, depending upon the type of lights in the ceiling, a Crew Member may remove the 2X4 light lenses to wash and dry them on both sides. Spot lights, vents, speakers and other ceiling hardware will be dried by hand to minimize drip marks. Upon completion of the ceiling washing and drying process, Ceiling Ease crew members will remove the tarping, clean any streaks from the floor, and remove splashes from stainless steel hoods and other items. Cleaning usually takes four to six hours depending on the size of the kitchen and the condition of the ceiling. Many restaurant managers are aware that their ovens easily damage tiles above the oven doors. Frequently, managers approve the replacement of up to 4 tiles in case the damage has permanently stained the tiles. In this instance, Crew Members will replace the tiles and remove the old ones. 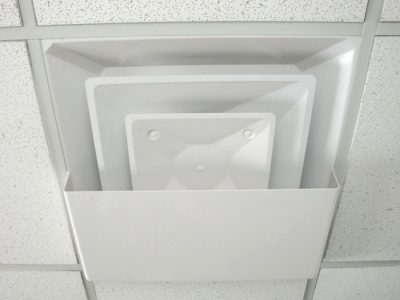 The result is a clean, professional looking ceiling that will appeal to employees, health inspectors, and those customers who may see the ceiling. It is recommended that in the morning, restaurant staff should mop the floor, return the breakables, and post any signage that was put away. After all that, the only thing left to do is admire how great the ceilings and kitchen look, and enjoy the boost in morale and brighter work environment. Restaurants, offices, hospitals, bakeries, clean their floors daily. What about those ceilings? Customers waiting for service or food look around, including up. 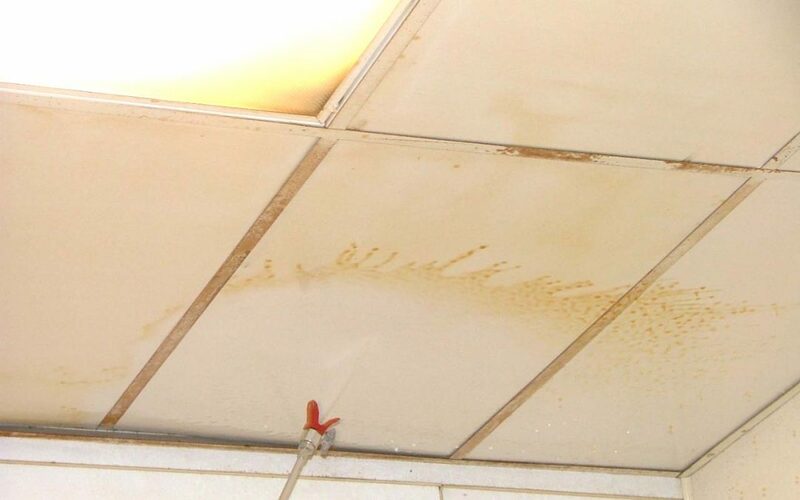 Health inspectors and corporate auditors see dirty ceilings as a poor reflection on the food being prepared. Clients in offices look at the ceiling while waiting for a meeting. Now you can improve your image with a low-tech, low cost solution. High tech tools have our attention. iPhones, tablets, social media all seem to be important aspects for work and home. But try to use these in a dirty environment. Suddenly a low tech application takes priority. Cleanliness helps make a good first impression. Cleaning and maintenance are daily requirements for any business hoping to retain customers. Ceiling cleaning is a green process, in that it is both environmentally and economically friendly. The removal of dull tiles fills a dumpster, the contents of which are then taken to a land fill. The tiles reside in the land fill for years as they decay. The replacement of the old tiles is costly. The purchase of sufficient tiles to fill a ceiling can be hundreds or thousands of dollars. One day you look at your ceiling and say “yuck”. It is cleaning time. To determine the best way to clean that ceiling, answer these questions. Does Your Location Pass the Smell Test? Are your customers greeted with a pleasant smell when they open your door? Or does the air smell stale, stagnant, and moldy? If your building is more than 10 years old, you may be starting to have an “old building” smell. Over time, ceilings tiles collect epidermal (skin) cells. Add this to the cob webs, occasional sprayed soda, and left over items from ceiling trade workers. The combinations of these things start making your air smell stale. In some buildings the smell of mold is sufficient to affect employees and customers breathing. 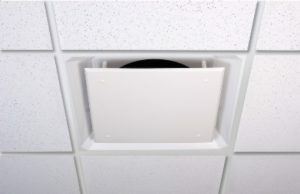 If you would like to give your offices a fresh smell, clean your ceiling tiles. 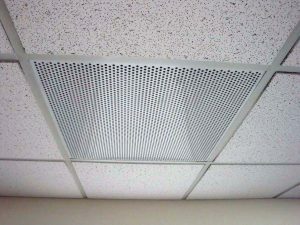 Most offices have acoustical tiles. These tiles easily last 20 years if not abused by festive decorations, air conditioning trade workers, and others. While they may look good, they will start to absorb smells. The spraying of your ceiling eliminates the skin cells, spider webs, and most stains. Within a few hours your location will have a fresher smell. If you have had a fire in your area, the spraying of a neutralizing chemical can eliminate that burnt smell. Older buildings may need to be sprayed above the ceiling also to eliminate the smell of dust layers. A fresher smell will appeal to your customers and employees and reflect positively on your business. Call for a quote. Cleaning a ceiling prolongs the life of the ceiling and gives your area a professional look. Eliminate that brown tint. Cleaning saves money, gives an area a brighter look, eliminates odors,and improves employee morale.